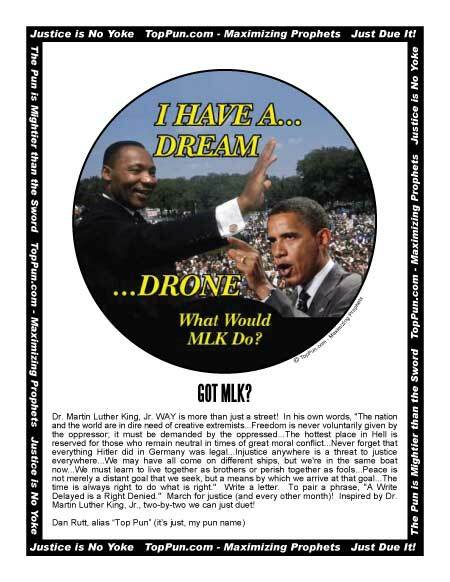 Download Free Martin Luther King Poster - "MLK Dream, Obama Drone"
Download this Dr. Martin Luther King poster for free, as part of Top Pun's campaign to celebrate Dr. Martin Luther King Day every day! Hang this Martin Luther King poster in your home or office. Share this free poster with friends and enemies alike! World's Largest Dr. Martin Luther King web store. Celebrate Dr. Martin Luther King, Jr. Day every day! Free downloadable Martin Luther King Posters require Adobe Acrobat Reader to view and print. Download "8-1/2 X 11" Free Martin Luther King Poster - "MLK Dream, Obama Drone"
"MLK Way" - More than Just a Street! Dr. Martin Luther King, Jr. WAY is more than just a street! In his own words, "The nation and the world are in dire need of creative extremists...Freedom is never voluntarily given by the oppressor; it must be demanded by the oppressed...The hottest place in Hell is reserved for those who remain neutral in times of great moral conflict...Never forget that everything Hitler did in Germany was legal...Injustice anywhere is a threat to justice everywhere...We may have all come on different ships, but we're in the same boat now...We must learn to live together as brothers or perish together as fools...Peace is not merely a distant goal that we seek, but a means by which we arrive at that goal...The time is always right to do what is right." Write a letter. To pair a phrase, "A Write Delayed is a Right Denied." March for justice (and every other month)! Inspired by Dr. Martin Luther King, Jr., two-by-two we can just duet! Top Pun is the unofficial outfitter for efforts to celebrate Dr. Martin Luther King Day every day! Please feel free to download these free Martin Luther King posters and pass them along to others. If you like these free posters, try these free Martin Luther King wallpapers. Download free Dr. Martin Luther King, Jr. stuff for all! Make every day gay pride day!